Reviews and opinions are mixed about Virgin Atlantic airlines. Some passengers love the way the crew love to chat with you: for others this can be a bit off-putting. 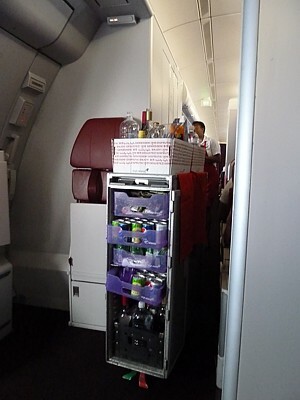 On other flights passengers have found the crew spending much of the fight in the Galley, and only doing a brief trolley run, not bothering with the extra drinks service in premium economy for example. This can get annoying at times, when the general feeling from a Virgin Atlantic review is that you are almost treated as a bucket-and-spade passenger on a charter airline en-route to a holiday resort. Then again, quite often, that may be the case. This feeling is emphasised by a long list of announcements and rules before takeoff, particularly relating to alcohol, and how consumption plus behaviour is monitored. In economy, this monitoring is real: pop into the rear galley and you'll see a list of seat numbers and how close they are to their prescribed limit of five beers. On a long route such as Hong Kong, that's one small can every two hours, which some may not perceive as being excessive. In premium economy, the forward galley is somewhat more lenient, if only because this galley only service the PE cabin as an add on to the main upper class galley. One thing that many passengers who are not from the UK notice in premium is that many passengers enjoy drinking their way through the flight. Certainly in Upper Class, there are no hang-ups about asking for a top up. As always your mileage may vary, but in general the crew on Virgin Atlantic are much more friendly (and younger, but less experienced) than on other airlines. Whether you enjoy this can be down to something as simple as whether you want to sleep through the flight, or enjoy cocktails at the bar. 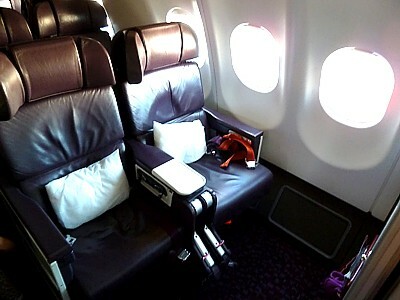 Your experience on Virgin Atlantic - 8 flights out of 10 - will start at London Heathrow Terminal 3. 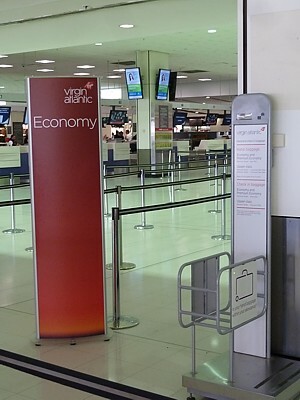 Here, Virgin occupy all of the left hand side of the terminal. As you approach, you'll even see the Virgin signs and logo above the door (Door A). Then, as you go in, you'll be split two ways. 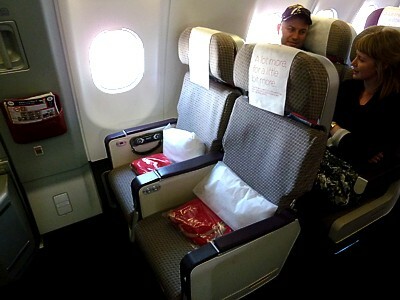 Premium Economy and Upper Class go right (it makes a change from turning left! ), along to traditional desks, while on the left you'll have to first go along to a self service kiosk before going to the bag drop. There are huge signs advertising upgrades, extra legroom seats, and emergency exit seats. Whether you buy one is up to you - but check beforehand what the real price is. 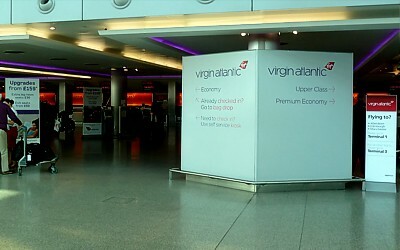 Virgin Atlantic publish a price list for buying upgrades at checkin. Long Haul in Upper Class things are good: the crew are noticeably attentive in the first couple of hours of the flight. You are normally greeted by name, there are usually pre-flight drinks (with Sparkling Wine) after you board, and there is then a newspaper trolley. The crew will come round with menus, hand out cold towels, and take your meal requests. The food then comes round on a trolley, with separate servings of each course. You can of course go up to the in-flight bar at any point in the flight: indeed, if you want a seat at the bar, you'd better go along early, as these go quickly, particularly on the holiday routes, or on the A340 where there are only three seats at the bar. 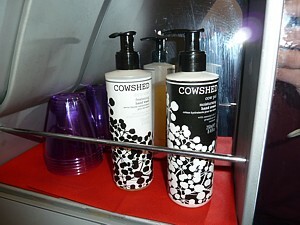 There are some other perks to Upper Class - the snooze pack in place of the amenity kit is a nice touch - and don't miss the Cowshed amenities in the toilets. It is in Premium Economy where the inconstancy in service is the most noticeable, with various items of service failing to appear, or be very late. In theory how it should work is that as soon as you take your seat, you are given a bottle of water for the flight, and offered a pre-flight drink, of water, orange juice, or Sparkling Wine. This is the only champers you'll see on the flight, so grab your bubbles now if you like them. Then there are hot towels, and the newspapers come around, with options of the Independent or the Mirror: some choice! It is only after takeoff and into the cruise do the other perks appear, with in turn menus, headphones (same as economy) and including the famous 'up-rated amenity kit': it still has the same items (pen, toothbrush, socks) but comes in a much nicer felt wallet. About an hour into the flight there should be a drinks run, with spirits (from large bottles not miniatures) or the one specified cocktail in the menu (typically, the Virgin Redhead). This drinks run is most commonly missed off the list when the crew are busy, late at night, or when they can't be bothered. If this happens, you are stuck with only other opportunity for a drink, when the food trolley comes around, however at least with this you get wine in 35cl bottles, rather than out of a large bottle in economy. Virgin Atlantic Premium Economy food is identically to that served in plain economy, but is served first, and the main dish comes in china not plastic, and there are real metal knives and forks, a proper cloth napkin, and a plastic version of the famous Virgin Atlantic Salt and Pepper set, called Wilbur & Orville. They are highly collectable. A long time after the food run the crew dash down the aisle handing out paper cups, and then walk down with coffee and tea in pots. Finally, trays are cleared some two hours later, and then there is the other perk of the after meal spirit service, with Baileys or Brandy (served in small glass glasses). The late running of the service means you may not get much sleep on an overnight sleep, because the lights are snapped back on two hours before landing, and breakfast comes around: this time it is the same as economy, with plastic cutlery. In economy you may have to wait a long time for any service. Before takeoff menus are handed out, and soon after reaching the cruise the crew walk through handing out headphones & amenity kits. 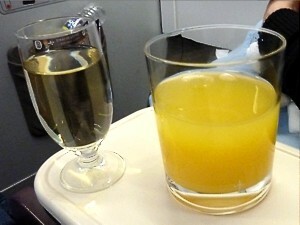 On some flights there is a cocktail run before the meal: if there is to be one, it is specified in the menu, but the crew don't always go on this – sometimes they can't be bothered or are too busy. An hour or so later they'll slowly start walking though with the food service, and finally there is a drink trolley from front to back. Drinks are handed out from big bottles on the trolley: there are no miniatures. Much later the crew hands out paper cups, and then walk down with coffee and tea in pots. It is a similar system for breakfast, with two trolleys, one per aisle, front to back, handing out the trays: the only difference is you may have to wait an hour between getting your food and getting a paper cup and some tea to put in it. 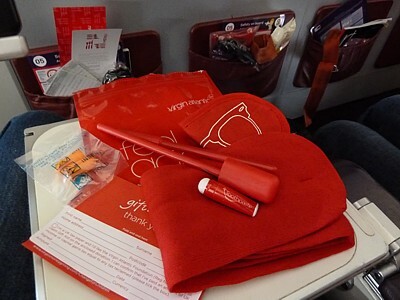 Virgin Atlantic hands out free personal amenity kits to all passengers in every class (except on domestic routes). These are given out with the menus and headphones, when the flight is into the cruise. 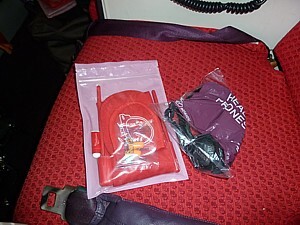 In economy, the Virgin Atlantic amenity kit comes on a cheap plastic wallet, coloured very red. It contains a (again, red) toothbrush and mini tube of Virgin toothpaste, pen, earplugs, eyemask and socks. 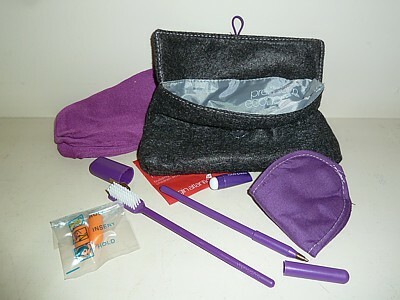 In premium economy, the Virgin Atlantic amenity kit looks very different, but actually the contents are identical. It has a great felt wallet/clutch bag type look, and when you open it up it even has a premium economy logo inside. All of the contents of this variant are purple - the Virgin colour for Premium. 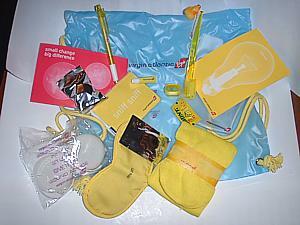 Alas, the contents are the same, with a toothbrush and mini tube of Virgin toothpaste, pen, earplugs, eyemask and socks. In Upper Class the new Snooze Pack replaces the amenity kit. 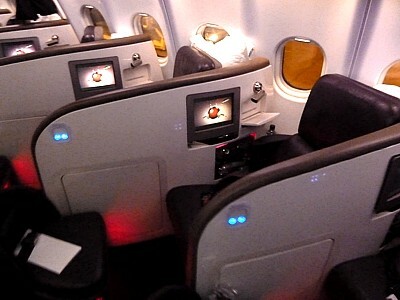 But it too is very similiar to what you'd get in Premium Economy, only this time everything is black! 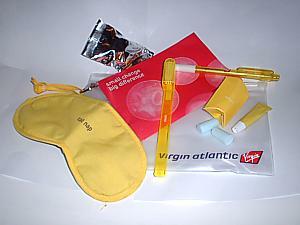 There are Virgin Atlantic branded socks in the Upper Class Snooze Pack, along with an eye mask, toothpaste and toothbrush and ear plugs. The only real difference is the bag is larger and reusable as a shoe bag. Virgin has changed the way it used to two things: there used to be two amenity kits; one (big) for daytime flights, the other (small) for night time. The big goodie bag used to come in a big roll up see through blue sack. It had a pair of socks - in lovely yellow. An eyeshade - also in yellow. A toothbrush (you've guessed it - in yellow - with a little yellow duck at the end) a tiny tube of toothpaste. Virgin pen, virgin notebook, two different types of mints, a small chocolate, wetwipe, and a change collection bag. The old nighttime pack came in a small white see through walet. It contained earplugs (good ones) an eyeshade (marked "catnap"), toothbrush (without a duck), toothpaste, a mint, a pen, and a change collection leaflet. This is never handed out any more. Virgin Atlantic has a pretty standard baggage allowance for each flight. Cabin Bags: Economy and Premium Economy Class passengers can take hand luggage of one bag weighing up to 6kgs into the cabin, business class can take two, max weight of 16kg. They must be no larger than 23 x 36 x 56cm, (approx 9 x 14 x 22 inches). Rules on contents (such as liquids) apply. Be warned that Virgin Atlantic used to be very lax about what you could take on board, with the result that everyone took on board everything including the kitchen sink. Now, they're draconian, and check bags carefully. You will get your cabin bag weighed at check in, and this weight it written onto a red tag that is stuck onto your bag. Of course many people find a way around this, and it's usual to see economy passengers take virtually everything out of their bags before passing the checkpoints, having stuffed their pockets full of everything small and heavy, only to repack their bags once onboard. Accordingly, a baggage check is now at the gate. Check in luggage: On all routes except to the United States economy class can check in one bag weighing 23kg, premium economy can check in two bags up to 23kg each, and Upper Class can check in three bags with each weighing a generous 32kg each. Routes to or via the United States or India have economy with an additional bag of up to 23kg. Gold Flying Club members gain an extra bag of 23kg of checked in luggage allowance. This benefit is not extended to Singapore Airlines or Virgin Australia Velocity Gold members. As always, these rules can change. Virgin Atlantic's website has details of exactly what you can take onto a flight.